If you prefer contact lenses, our optometrists are experts in the fitting and problem solving of 21st century contact lens products. With modern technology, we are able to fit most prescriptions with contact lenses. 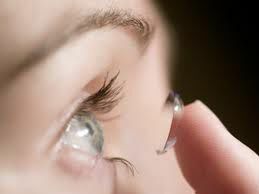 Our optometrists fit the contact lens to your eye, not the eye to the contact lens or what?s known as a ?custom fitting?. Our aim is to achieve good vision, comfort and eye health. Regular checkups and following the right procedures are the key to successful contact lens wear. Whether you would like to wear your contact lenses full time or just for social occasions or sport, we can tailor a solution for you. If you have worn contact lenses but discontinued them because of discomfort or the inconvenience of upkeep, it is worth discussing whether you can wear contact lenses again. Ask us about volume discounts on your contact lens orders.